Ezekiel Jenkins is finding it hard to adjust going home and reconciling with his estranged dad. Life in Freetown isn't a cakewalk either. Zeke struggles to find work, battles some goons, and deals with echoes of the past. On top of everything else, Zeke's dad discovery has become a blessing and a curse with yet unforeseen consequences. Rob Guillory has jammed a lot of story in each issue so far. It's great in terms of getting your money's worth but can sometimes seem unfocused. Nonetheless, 'Farmhand' is above all a family drama that just so happens to revolve around the patriarch growing human body parts on his farm. For son Zeke, the move to his hometown with his wife and kids has been...bumpy. The kids are finding it hard to adjust to a new school and new kids, bullies included. His wife has fared better except for the creepy shopkeeper she encounters. Zeke can't land a job and as the son of what many consider a mad scientist, he's been targeted by shady forces. As you can tell a lot is going on. Guillory tries to juggle plot and subplots with varying success. The tone shifts from familial nostalgia, mystery, scientific wonder, to humor and action. It's all over the place but it's not chaotic. Guillory is building this world and how it affects everyone in the Jenkins clan. It's mostly centered on Zeke but we get glimpses of the lives of other characters and how it's all tied together. New dangers loom and make for an intriguing development going forward. Despite the varied storylines, 'Farmhand' continues to entertain with a unique set of circumstances both mysterious and funny. Guillory's art is fantastic. The cartoonish style is fun and colorful which heightens the funnier moments but can still find a way to be effectively haunting as it does in the final pages. Seeing Zeke's growth in a 15-panel page to open the book was especially well conceived and executed. Taylor Wells' colors are rich and bright and really infuse the story with abundant life which seems appropriate for a story about farming. 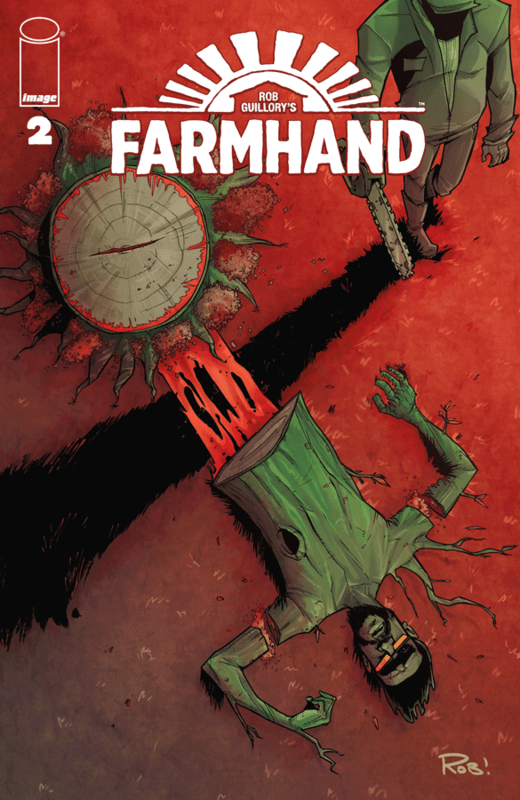 'Farmhand' #2 is another thrilling chapter that's expansive and full of small-town drama. Guillory's creativity both in writing and drawing gives this sci-fi story a wonderful blend of horror and action that is never boring. It's a definite worthwhile read.